Counterfeit drug prevention is a major use-case for blockchain in healthcare, said Tapan Mehta, market development executive, healthcare and life sciences services practice, at DMI, a mobile technology and services company. Potential applications for blockchain in the pharmaceutical industry already are being explored. Take the BlockRX initiative, for example, that has been set up to address the drug supply chain integrity problem by leveraging the distributed digital ledger to support and manage the drug development lifecycle. Mehta also said transparency and traceability are key to blockchain in the pharmacy supply chain. The decentralized structure of the ledger would make it impossible for any one party to hold ownership of the ledger and manipulate the data to their own advantage, Mehta added. Shahram Ebadollahi, vice president of innovations and chief science officer at IBM Watson Health, said he sees four use-cases for blockchain that are especially well suited for the pharmacy supply chain. Second, controlled substance monitoring. The federal government increasingly is holding the pharmaceutical industry responsible for monitoring the supply chain for the illegal and out-of-pattern ordering of Schedule II drugs (opioids) and is penalizing distributors. Manufacturers are concerned that they, too, will soon be held accountable. And fourth, active pharmaceutical ingredients. Monitoring the source and provenance of active pharmaceutical ingredients from raw materials through active pharmaceutical ingredients stage manufacturing and final product manufacturing. The active pharmaceutical ingredients process ends where the processes covered in the Drug Supply Chain Security Act begin. Blockchain offers two critical opportunities for the pharmaceutical supply chain, according to Maria Palombini, director of emerging communities and initiatives development at the IEEE Standards Association. Those being combatting counterfeits and supply chain optimization. The nature of the drug distribution model compels all three trading partners to have equal transparency into the auditing and tracking of inventory as one depends on the other to ensure medicine is delivered to patients as securely and quickly as possible. Therefore, again, there are three trusted partners who need visibility of the supply chain and verifying the journey of the drug from manufacturing to the patient. If every entity on the supply chain can have visibility of inventory and audit the distribution of the medicine, that certainly makes it more difficult for counterfeits to reach the market. Manufacturers, wholesalers and pharmacies currently use a variety of tools to help with all of these processes. But there are simply things that blockchain can do that other technologies cannot. Big pharma, for instance, currently uses several different software programs and databases to manage drug supplies. The introduction of a blockchain system – in which each participant controls a node on the network, and each transaction requires a consensus – would revolutionize the drug supply chain, said Mehta of DMI. Blockchain is unique because all permissioned users are working with one original, immutable source of information where every chronologically stamped transaction is replicated in every block of the chain that can never be altered, IEEE’s Palombini explained. “This allows for all parties to verify the source of the information without doubt,” she said. “The very fact that information on the blockchain is immutable enables all the partners on the chain to know they are working with one single record of truth. Blockchain offers the potential as a unifying solution for management of the pharmaceutical supply chain. Its distributed construct would enable true end-to-end supply chain management and allow participation by multiple stakeholders, rather than being architected as the vulnerable patchwork database approach currently in place, said Clauson of Lipscomb University. Today, pharmacy supply chains are a series of linked but separate events. Participants often end up buying back data to gain a view of how their products are used or consumed. By allowing all parties to a transaction access a common record, the veil is lifted, said Giles Ward, executive director at Hashed Health, a consortium of healthcare companies focused on accelerating innovation using blockchain and distributed ledger technologies. Unlike with other solutions, Blockchain participants retain control over their data, including who can see it. Trading partners can share data necessary to complete transactions while keeping priority information confidential. 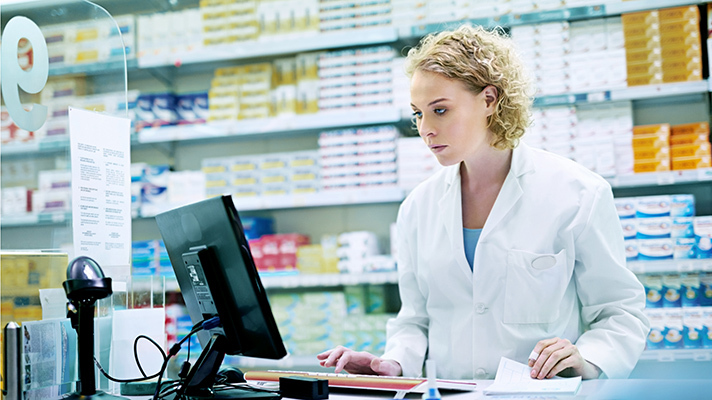 A big question is, how can blockchain help streamline processes or enhance data in the pharmacy supply chain? There are many ways. In a linear, transparent process, it becomes very clear who is adding value to a transaction and who are merely “rent seekers,” Hashed Health’s Ward said. “Intermediaries are going to be forced to prove their value or they will be circumvented,” he explained. Large pharmaceutical companies function through complex and often outdated centralized systems that impede optimal supply chain efficiency, DMI’s Mehta added. Simply put: The ability for blockchain to track and distribute data throughout the chain delivers visibility to inventory that was never present before. Acknowledging that the aforementioned benefits are still theoretical in nature, Lipscomb University’s Clauson said that half-a-dozen companies have for the past few years been working on blockchain-enabled Drug Supply Chain Security Act compliance platforms. Those include BlockVerify, iSolve/BlockRx, Chronicled, The LinkLab, Modum, and Vechain. Blockchain holds great promise for the pharmacy supply chain, as it does for other healthcare applications. It’s early days, but the great potential of blockchain may move more companies into the fold.